Ten-man Bohemians had to wait until the 89th minute before they grabbed a late and well-deserved equaliser against a retreating Bray Wanderers at Dalymount Park. Owen Heary’s men were a man down for over an hour after Dean Delany was sent off for a challenge on Bray’s Jake Kelly. The resultant penalty put Bray into the lead, but the Gyspies fought back to claim their second 1-1 draw in as many games. While Steven Beattie was awarded the Mr Green Man of the Match Award, it was referee Sean Grant who was the centre of attention, with a series of eccentric decisions that had the Jodi Stand hopping with rage, writes KEVIN FAGAN. Bohs boss Heary made just two changes from the team that drew away at Dundalk, with Steven Beattie replacing Keith Buckley and Dinny Corcoran replacing Jason Byrne. 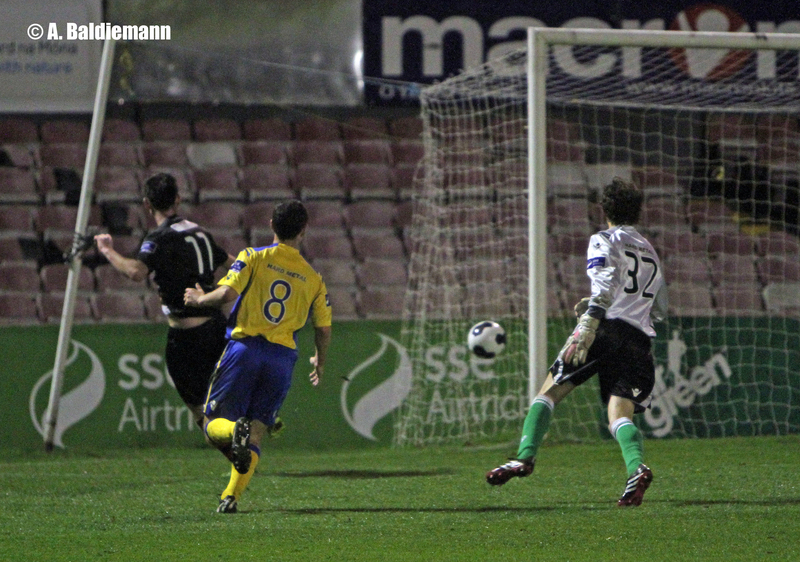 Bohs fan Dano Byrne continued his shielding of the back four. Bohs started fast, the first ten minutes were quick-fire with good crisp passing and attacking threat. Beattie forced Bray keeper Stephen McGuinness into an early save. Bray are still finding their feet under Alan Matthews, and gradually began to find their feet in this game. Big frontman Ismahil Akinade was causing problems for Aidan Price and Roberto Lopes, while Jake Kelly was buzzing around picking up second balls. Bohs fans have been clamouring for keeper Dean Delany to come off his line for many a month, but they would have given anything for him not to have done so in the 20th minute. A long punt from full back Robert Maloney split the Bohs defence, and with Jake Kelly getting close to the ball, Delany rushed out and pole-axed the Bray forward with a very clumsy lunge. Referee Grant produced a red card, but there was a massive 5+ minutes of waiting before the penalty was taken. Kelly was clearly seriously injured and left the field on a stretcher. Bohs cult favourite Dave Scully replaced him, and eventually Graham Kelly stepped up and scored his penalty past new Bohs debutant Lee Murphy. Bohs were rattled for a full 10 minutes after the concession. Matthews will rue the fact that Bray didn’t press home their advantage. Shane Byrne had a free pop at goal from 16 yards but could only scuff into Murphy’s arms. Gradually, Bohs got over their shock and began to regain their footing in the game. Steven Beattie was bustling and industrious down the right flank, but got on the wrong side of referee Grant after tangling with Adam Mitchell. Beattie eventually won a free kick on the stroke of half time, and Darragh Reynor’s cross found Aidan Price’s head – just like last week in Oriel Park. However, this time Price’s header cannoned off the crossbar and looped over. The second half was barely two minutes old before Bray’s best chance to seal it arrived. Akinade charged down Price’s rushed clearance, and suddenly found himself through on goal. His floated shot flew past the onrushing Murphy, but fell wide much to Bohs’ relief. On the hour mark, Beattie had a great chance to equalize after being played through by Craig Walsh, but his shot was well saved by diminutive keeper McGuinness. Heary made a key substitution with 20 minutes left – Kevin Devaney came on for the ineffective Karl Moore, and immediately injected a purpose into Bohs’ play. Gradually, the pressure built, and the goal came with just a minute of normal time remaining. Walsh sprayed an amazing ball over the top of the Bray defence to set Corcoran through. The Bohs frontman showed great composure to let the ball beat him and McGuinness simultaneously, before slotting firmly into the empty net. The goal actually put Bohs into the top half of the table, and Heary’s men will be looking to add to their total when they visit point-less Athlone on Monday evening. Bohemians: Dean Delany, Derek Pender, Aidan Price, Roberto Lopes, Darragh Reynor (Jason Byrne, 78), Karl Moore (Kevin Devaney, 69), Daniel Byrne, Craig Walsh, Steven Beattie, Paddy Kavanagh (Lee Murphy, 22), Dinny Corcoran. Subs not used: Stephen Traynor, Ryan McEvoy, Philip McCabe, Keith Buckley. Bray Wanderers: Stephen McGuinness, Shane O’Connor, David Webster, Adam Mitchell, Robert Moloney (Shane O’Neill 78), Graham Kelly, Dean Zambra, David Cassidy, Shane Byrne, Jake Kelly (Dave Scully, 27), Ismahil Akinade. Subs not used: Jamie McGlynn, Gary Curran, Niall Cooney, Ciarán Byrne.